It’s called the Queen’s Gallery. In reality, it’s a hallway — a short one, too, in spite of its regal name. In it, 56 faces, captured in a moment of elation, stare at the people who stumble into their realm. They are the former Indiana State Fair queens, and they command your admiration in their domain, also known as the Indiana Arts Building. “Look at that crown,” one woman murmurs in awe as she scans the rows of pictures and their frames. The photos show the queens in the gowns they wore before winning their titles. The first picture is from 1958, the second from 1959 and on and on they go, from one wall to the next, all the way up until 2015. The styles change, and the hair inflates, then deflates again. All the photos are arresting. Their subjects are royalty, after all. Although queens these women may have been, their job at the fair was somewhat mundane. 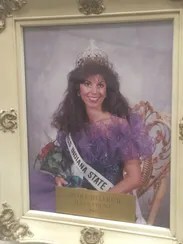 They were spokeswomen — the face of the fair, said Bobbi Bates, the fair’s entertainment and events manager and Miss Indiana State Fair 1991. The fair queen gives interviews to media outlets and shakes hands with the public. “It truly is a job,” Bates said. It has become more of one throughout the years, too. The queen pageant, held every January, no longer references beauty. The bathing suit portion of the competition was switched to active wear in 1990 before being scrapped completely five years later. Now, the contestants bring their crispest pantsuits and dresses for the professional wear category. The contestants still wear dresses during the pageant, but it’s not so much about the style. “I tell girls all the time, “You can wear a feed sack, but if you rock what you’re wearing and you believe in it and you act like it’s the best thing going, that’s what we look for,’” Bates said. Morrison isn’t actually wearing a gown in her official picture. 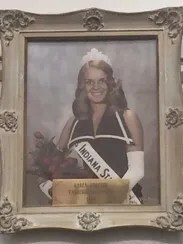 Instead, she was crowned in a black satin bathing suit with gold thread at the first Indiana State Fair Queen Contest in 1958. Morrison was nominated by the Montgomery County Fair Board to compete in the state contest because the county wasn’t given enough notice to host its own pageant. As a result, Morrison had to borrow the suit from her aunt. She got her dress from a neighbor: a white strapless gown with sparkles, a low waist and a hoop skirt. Morrison lives in Attica, and works at her husband’s law firm. The couple also raise horses. Morrison received her undergraduate degree from DePauw University and her master’s from Indiana University. Ade’s dress was “definitely” from the ’70s with its large, brown collar and white piping. It has since come back into vogue with the recent trend toward all things vintage, Ade said. Her young niece loves it, at least. When Ade bought the dress, however, her and her mother’s biggest priority was a material that wouldn’t wrinkle on the way from Evansville to Indianapolis. The mother and daughter duo bought the dress the day before the pageant, stuffed it into a suitcase, and drove it the three hours to the Indiana State Fairgrounds the next day. Ade was a 4-H girl, not a pageant one, but she was glad that she was talked into the contest after she won. It shaped her future. Ade and her husband met at a leadership conference before Ade won the pageant. But during the actual fair, he knocked on her car’s window and reintroduced himself. One of the most memorable parts of Ade’s time as fair queen, however, was handing out ribbons to her fellow 4-H members. Ade also found her career path at the fair. 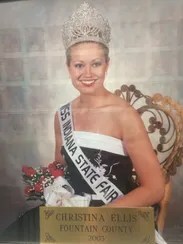 She enjoyed the public relations aspect of her time as fair queen, got a degree in public relations from Purdue University and has been working in the field ever since. She also is a fitness junkie and personal trainer. She now lives in Maryland. Medley-Duncan got a lot of wear out of her dress. She bought the simple black gown for her prom, wore it to her county fair pageant and won the queen pageant in it. She spiced up the dress, which had an empire waist and pleats, with a 14-karat gold star necklace and a black onyx ring. Medley-Duncan showed cattle and hogs the year she was queen. She had to quickly change from her royal attire to blue jeans and cowboy boots and back again several times throughout the fair. Medley-Duncan never left the livestock business. She graduated from Purdue University with a degree in agricultural communications and now owns and operates A&M Futures, a commodity brokerage business in Crawfordsville. She trades grain and livestock and still shows her own, too. Her 200 full-blooded boer goats have won national championships. Easton stayed true to her no-fuss roots when she planned how she would look for the State Fair pageant. She found her silver dress on clearance at a small bridal shop in Ohio — not far from her small hometown of Portland. Easton also curled her own hair and applied her own makeup. Her form-fitting sequined dress was actually a little more daring than she would have liked. She said wasn’t crazy about the lack of straps. Still, she loved it, kept it, and she still lets others borrow it. Easton’s daughter wore it to prom in 2012. Easton did not think she would win the pageant. While the host announced the third- and second-runners up, skipping Easton’s name, she just assumed the person standing next to her would be named queen. No one else seemed surprised, though, when Easton’s name was called. It took awhile for Easton to adjust to attending the State Fair as a queen and not a 4-Her. She had to be told not to climb over gates in her dresses. Still, Easton liked seeing the 4-Hers look up to her as she handed them their ribbons at the fair. State Fair judges told Easton she had a great interview during the pageant — that she was beautiful. Easton said she didn’t see that, but she’s always been more about helping others than thinking about herself. Easton is still like that. She fixes meals with her church and volunteers with various programs. She also is a coach for Jay County’s queen contest despite living in a different area (Fort Recovery, Ohio). Easton teaches her girls how to walk, turn, pose and crush an interview. She is an accountant with her own tax-helping business. McVicker almost didn’t go with the wild purple dress she wears in her queen picture. She picked out a a black sequined dress originally, but someone told her she looked “sophisticated” when she wore the gown with her hair up. McVicker wanted to look as young as her 19 years, so she wore her flared junior year prom dress and freed her puffy, early-‘90s hair. Luckily, the judges liked it as much as McVicker still does. She keeps it in her closet along with the black dress. She’ll never give the two keepsakes away, she said. It was McVicker’s “heart’s desire” to win, and she was surprised that God let her have it, she said. He actually gave it to her twice. 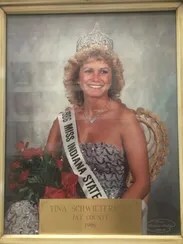 Halfway through McVicker’s reign, the state fair’s director called her to say that the pageant had been moved from the beginning of the fair to the end due to scheduling conflicts with the Brickyard 400. McVicker was asked to reign over the state fair for another summer. Some fair-goers were as excited as McVicker about the change — or lack thereof. One woman told McVicker that she was much prettier than the previous fair queen despite that queen also being McVicker. McVicker went to Purdue University for her undergraduate degree, but she then moved to Washington state for law school. She gave the valedictorian address at her graduation. It wasn’t hard for her, she said. She was used to giving speeches after her summer of traveling from county fair to county fair during her State Fair reign. McVicker is now an attorney in Marion, and also teaches at Ivy Tech Community College and Taylor University as an adjunct law professor. Owings would still wear the dress that helped her win the fair queen title — if she ever had the occasion to. She still thinks the black and white and the embroidered flowers are “timeless.” The dress also fit her almost 6-foot frame. She placed a hold on the dress when she tried it on in a small Crawfordsville shop, and she decided to keep it even after a tour of different Indianapolis boutiques. Owings didn’t win her county pageant the first year she entered. The second time she signed up, however, she received the county and the state title. During the fair, Owings enjoyed being driven around in the royal golf cart as she traveled from one event to the next. She remembers the shouts of “Hey, Queenie” and the invitations to sign odd objects. Once, she scrawled her signature on a corn dog stick. Owings will graduate from Johns Hopkins University with her master’s degree during this year’s state fair. She lives in Zionsville and works at Thermo Fisher Scientific, where she deals with drugs undergoing clinical trials. She likes that her job will have a positive impact on society.